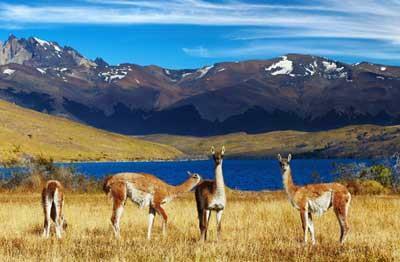 Get to know Chile, its capital, and its closest nearby coastal attractions, like Valparaiso and Viña del Mar. Enjoy wines from one of the most famous Chilean wineries: Concha y Toro, and then end your stay with a few days in the driest desert in the world: Atacama, having intimate contact with its natural surroundings and painted landscapes. 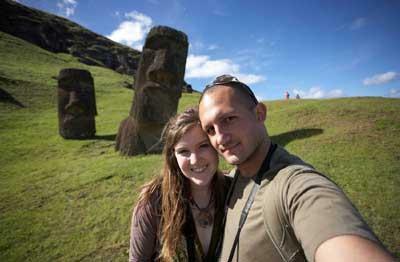 Easter Island is the largest island of Insular Chile. Also known as Rapa Nui or "Te Pito O Te Henua" ("Navel of the World"). Furthermore, it is considered the most remote inhabited island in the world, and with it was declared a World Heritage Site by Unesco. We invite you to explore its privileged landscape of pink sand beaches, such as the Ovahe; or the paradisiacal charm of Anakena, its volcanoes and grassland rolling away the horizon to go both on foot or horseback. Moreover, its exquisite flora and marine fauna urge us to discover it either diving or walking quietly by their caverns. Let yourself be amazed by the narrative of the history of the Moais, faithful witnesses of the rise and fall of a millennial society. 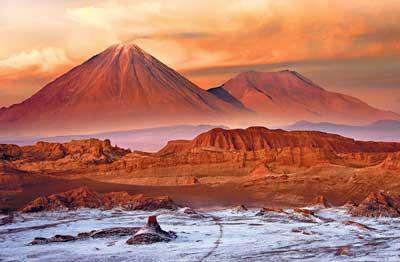 San Pedro de Atacama is an ancient village located in the north of Chile. This site stands out as being an area of great tourist and archaeological interests. In addition, the village is also known as the perfect gateway for exploring the world's driest desert, the “Atacama Desert”. Its spectacular scenery provides visitors stunning topographical features, such as Lagoons, Volcanoes, Salt flats, Geysers, natural Hot Springs; that along with the clearest skies in the world, are some of the attractions you can find in this fascinating destination.